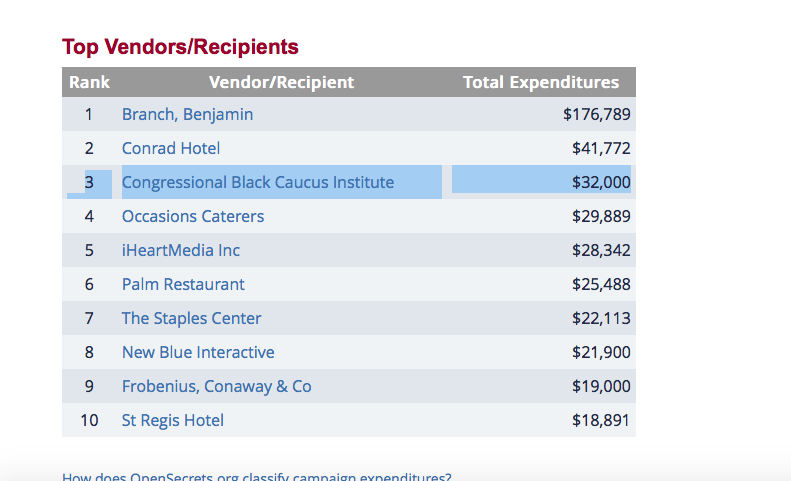 The Congressional Black Caucus PAC (CBC PAC) spends lavishly on upscale resorts and hotels, catering at exclusive restaurants, and on fundraising and Broadway tickets, according to a review of campaign finance records. 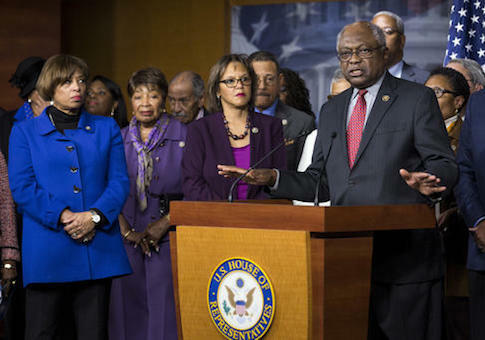 The CBC PAC, which is the fundraising arm of the Congressional Black Caucus, puts far more money towards administrative and fundraising purposes than it donates to candidates, the intended purpose of the political action committee. The CBC PAC claims its mission is to increase "the number of African Americans in the U.S. Congress" and to "support non-Black candidates that champion our interests, and promote African American participation in the political process-with an emphasis on young voters," according to its website. A $5,000 payment was made in January 2016 from the PAC to the Buccaneer Hotel located in St. Croix, Virgin Islands, one of the "world's top 50 tropical resorts." Later, on March 21, 2016, the PAC made another payment to a resort in the Virgin Islands. This time, the money went towards a stay at the "one-of-a-kind" Renaissance St. Croix Carambola Beach Resort and Spa also located in St. Croix. The Renaissance is situated "among the foothills of a lush tropical rainforest and only steps away from the pristine sands of Estate Davis Bay." The PAC spent $820 on taxicabs while in the Virgin Islands. More than $2,000 was spent at Sweeny's St. Croix Tours in the town of Christiansted, considered "the most beautiful town in the West Indies." Sweeny's provides an open-air bus for its guests as they embark on safari tours of the island. More than $4,500 was also spent by the PAC on catering at Un Amore, an Italian restaurant. The group's largest expenses were made in New York and Washington, D.C. The Conrad Hotel, a luxury all-suite hotel located in New York City, is a favorite of the PAC, which spent in excess of $40,000 at the venue throughout the last election cycle. Another favorite of the PAC, the St. Regis Hotel in Washington, D.C., that "plays home to dignitaries, royalties, and refined travelers alike," received more than $18,000 in payments from the committee. Other expenditures by the group included $6,576 on lodging at the 5-star Beverly Hills Hotel and $3,268 on lodging at the Waldorf La Quinta Hotel, Resort, and Spa located in La Quinta, Calif. The PAC spent $4,180 at the MGM Grand Hotel and Casino in Las Vegas and also spent $3,372 for "facilities rental" at Drai's Rooftop Bar and Lounge at the Cromwell Las Vegas Hotel and Casino on the trip. More than $2,000 was spent at the Fantasy Springs Resort Hotel in Indio, Calif., while $1,421 went towards rooms at the Harbor View Hotel at Martha's Vineyard, among other hotels and resorts. Tens of thousands also went toward fundraising event tickets and catering at high-end restaurants from the PAC. The group paid $28,342 for "fundraising event tickets" to IHeartMedia Inc., a mass media corporation in San Antonio, Texas. The PAC put $22,112 toward "tickets and catering for a fundraising event" at the Staples Center, a sports arena, in Los Angeles, Calif. More than $25,000 was spent on catering at The Palm restaurant in New York City while $27,070 was spent on catering at Bobby Van's Steakhouse in Washington, D.C. Thousands more were spent at other restaurants. The group also spent $1,621 on Broadway tickets and another $5,960 at the Golden Theater in New York City. 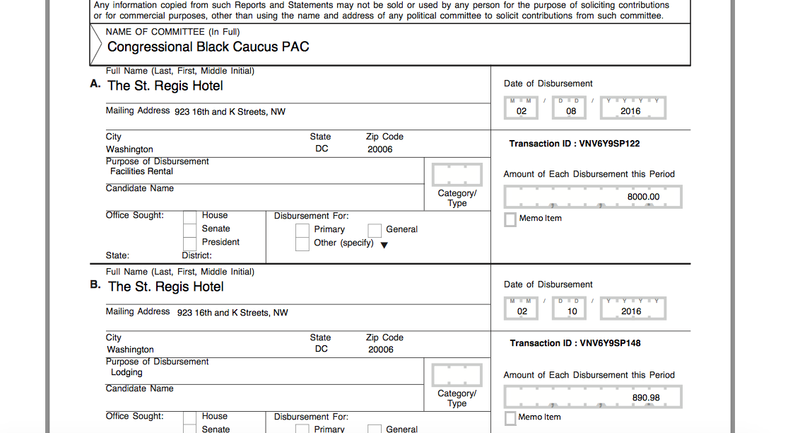 The PAC additionally paid $32,000 in rent to the Congressional Black Caucus Institute, a non-profit that plays a "pivotal role in training the next generation of political leaders and providing voters with relevant information regarding issues in their communities," its website states.